Feminicide has been considered the most extreme form of gender violence and one of the worse human rights violations in Mexico. However, little academic attention has been given to cases different to Ciudad Juárez although the phenomenon has spread throughout the country, placing on the top the case of the State of Mexico. For this reason, this research considers the role of online media in the representation of victims of feminicide in the State of Mexico during the year 2011, in four newspapers. 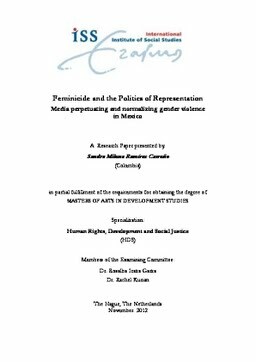 A multi-dimensional approach that included concepts of gender violence, feminicide, politics of representation and critical media theory were used in order to analyse the representation of the phenomenon. Further, “Member Categorization Analysis” and “Framing” were used as tools of discourse analysis. The first was applied to established how women victims of feminicide are represented by the media, while was used to find the main frames that delineate the discourse of feminicide. Findings revealed that online newspapers reinforce traditional gender stereotypes through the use of categories and stereotypes of women and men. In doing so the media normalizes and reinforce gender violence. Although the online newspapers selected has different editorial line, the politics of representation of females victims was the same.